There are many ways to assess a pupil’s progress from informal observation to standardised assessments. Assessments can tell us a lot about a child and can be valuable, but it is important that we do not allow them to create a stressful experience for the pupil. 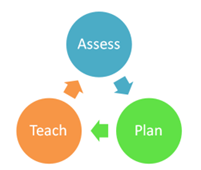 Assessment can inform our next steps so that teaching is appropriately pitched and takes the pupil from what they know to what they need to know. Screening tools are useful in finding any gaps in a pupils’ understanding and skills.